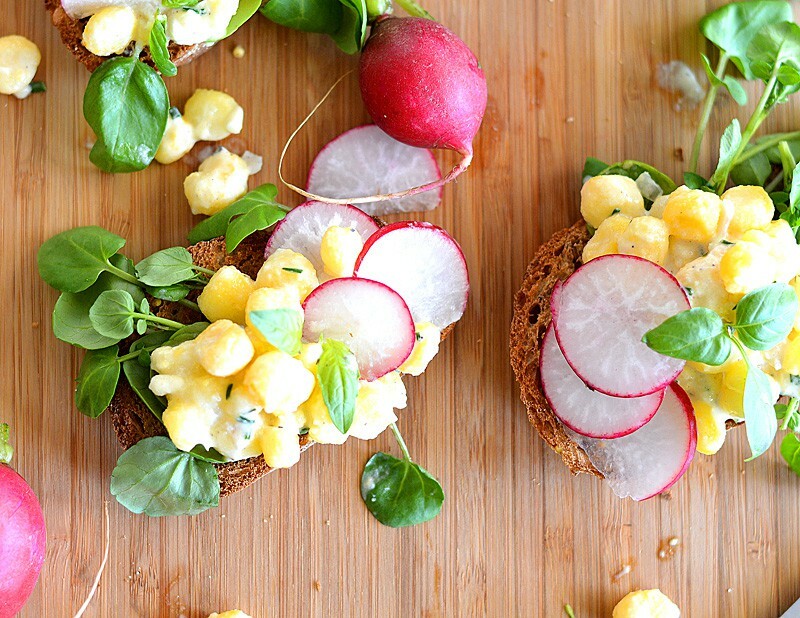 This recipe for Golden Hominy Salad Tartines was inspired by one in a magazine called Cook Fresh and just screams “spring”, don’t you think? That particular inspiration recipe wasn’t vegan and featured an egg salad. 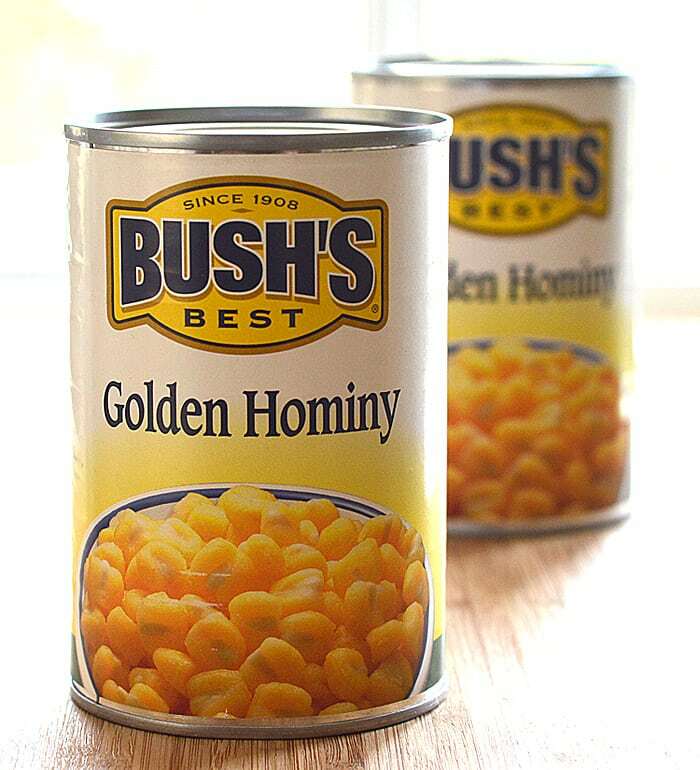 I always love the challenge of seeing what I can come up with as a substitute and instantly, Golden Hominy came to mind. Hominy is very soft and you could certainly mash it, but I chose to leave it whole. A coarse mash might be nice. But I’m getting ahead of myself. There’s a good chance you aren’t familiar with hominy, so let’s start there. If you haven’t tried Hominy before, you are in for a treat. Hominy is a fancy name for field corn (maize) that has been treated by soaking and cooking it in an alkaline solution. The result is a plump, tender kernel with a mild, sweet corn flavor that literally almost melts in your mouth. I found it at my local Walmart (of all places). They carry both the white and the golden. Either is perfectly fine, but aesthetically, I prefer the golden for this application. I like to drain and rinse prior to using. Additionally, you’ll want to spread them out onto paper toweling and gently pat dry. I also let mine sit there while I make the rest of the dish. They are packed in water and we don’t want that in our salad or it will become runny. 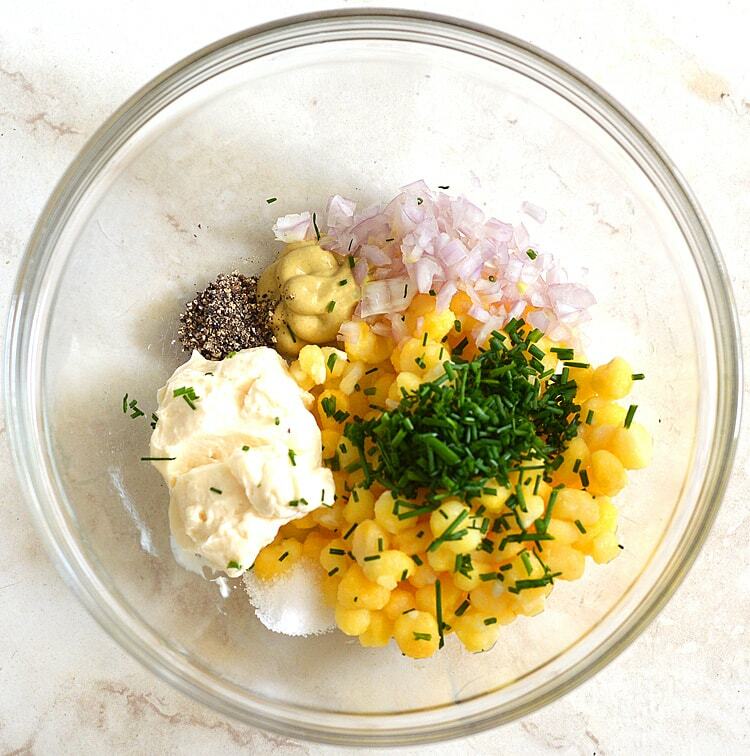 In a large bowl, combine the hominy (be sure it’s free of any excess moisture), vegan mayonnaise (add about 1 Tbl to start), minced chives, finely chopped shallots, dijon mustard, lemon zest, coarse salt (or for an “eggy” flavor, try a black salt called Kala Namak) and ground pepper. Lightly toss to combine. Continue adding the vegan mayonnaise until it is the right texture. The reason I do this is because of the moisture content of the hominy. Easier to add then take away. All that’s left is to prepare the toppings. 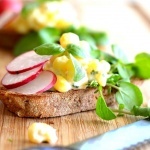 As per the inspiration recipe, I chose to stay true to the watercress, basil, radish and black pepper. 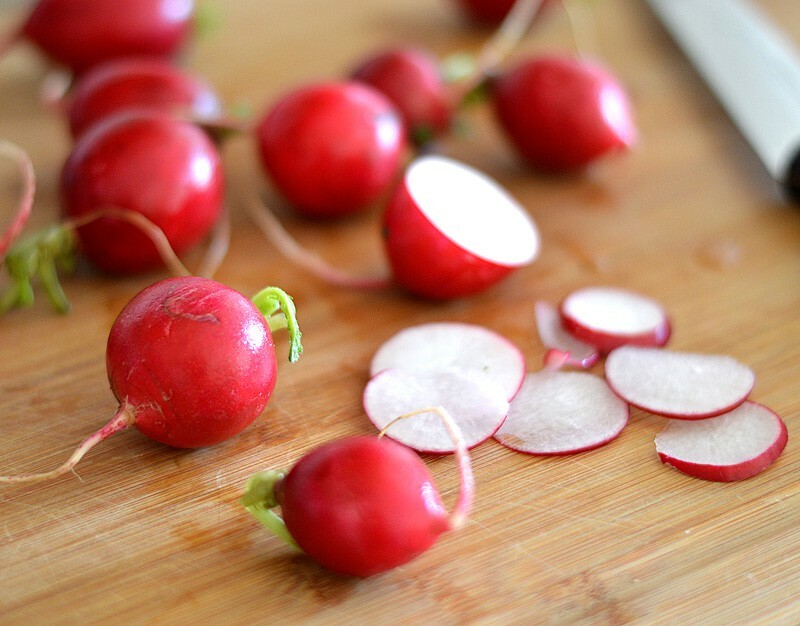 Slice the radishes thin. I much preferred them this way. And here is what they looked like completed! How pretty 🙂 And delicious. 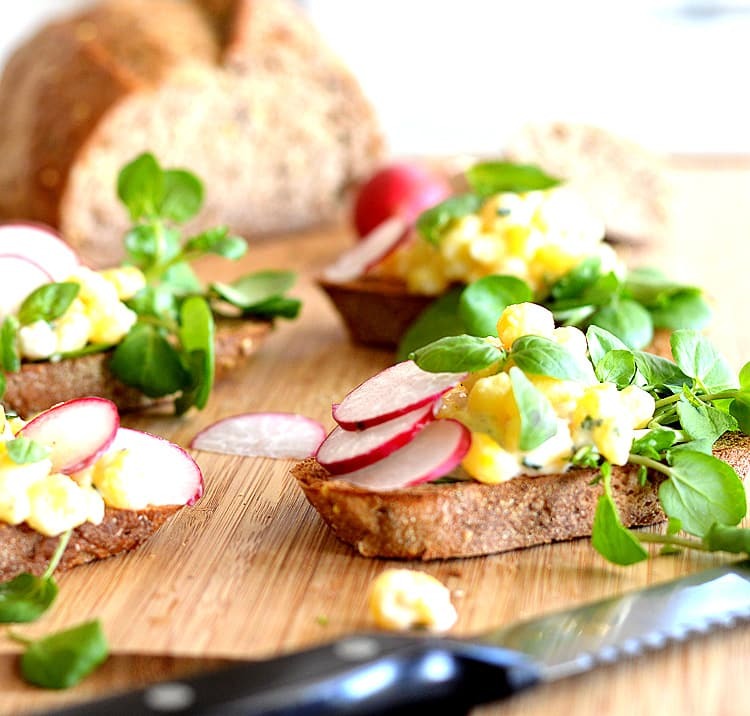 Try serving these Golden Hominy Salad Tartines at your next luncheon or get-together laid out on a platter, or even a cutting board. Your guests will love them! If you are intrigued now about hominy, I have worked with it a few other times in the past. Check out this recipe for Grilled Creamed Corn and the recipe I used it in, Penne with Grilled Creamed Corn & Zucchini. And my personal favorite, Hominy and Green Chile Dip! <<< Blue corn chips with this one. Yum!! Begin by draining the Hominy. Lay out on paper toweling and pat dry. 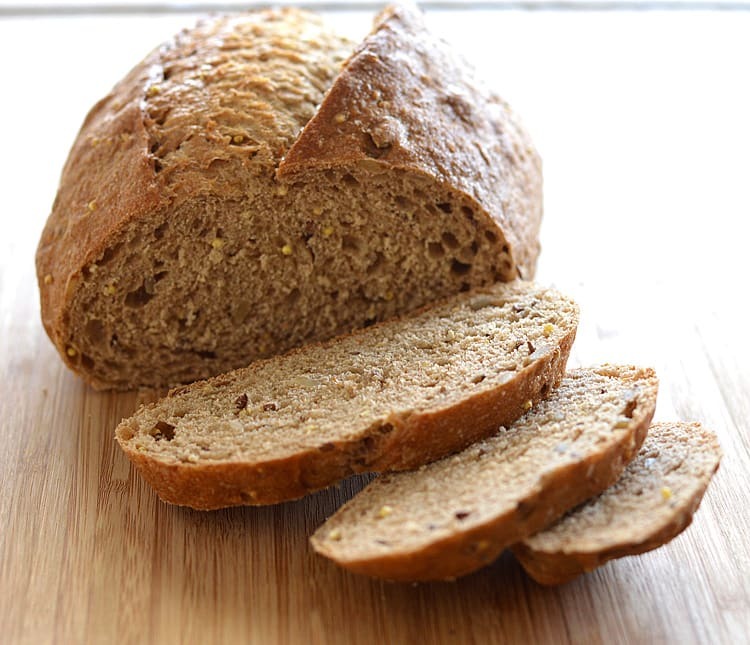 Allow to air dry as you prepare the remainder of the recipe. Thinly slice the baguette and toast until the edges are golden. Allow to cool completely. In a large bowl, combine the salad ingredients, beginning with 1 Tbl of the vegan mayonnaise at a time. Add more as needed. Place the watercress leaves down first and top with the salad. 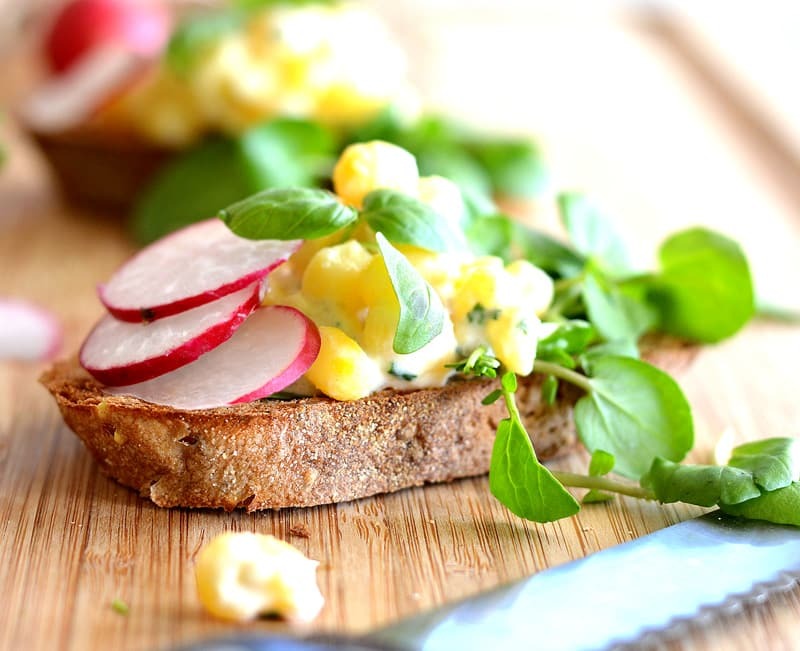 Add the sliced radishes, a few small basil leaves and top with freshly ground pepper.